Zebra True Colors card printer ribbons produce high-quality IDs and extend the life of your printers and cards. Benefit from : Vibrant colors, "true-to-life" flesh tones, and sharp barcodes and text. Patented print ribbon technology for minimal printhead buildup and durable cards. Advanced RFID intelligent technology for automated ribbon detection, driver configuration and more.. 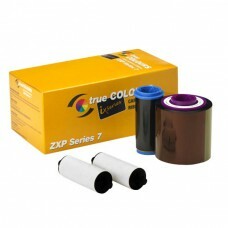 Tags: Zebra Bravo ZXP Series 7, 5 Colour Ribbon YMCKO.